Give a Gift Every Year, Make a Difference Every Day! Please note that credit card donations do incur a fee of 3% or more, reducing your total donation. Checks enable CCS to benefit from every cent you give. The Annual Fund is called the Annual Fund because we need your help each and every year to enrich Cary Christian School’s educational opportunities! We are a 501(c) 3 non-profit organization with a limited budget. 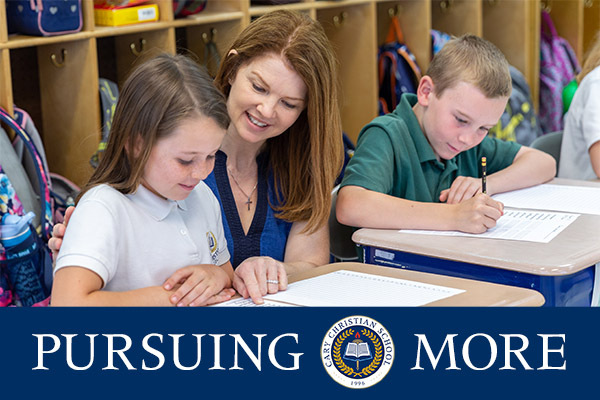 We have a strong commitment to offering an outstanding educational experience to our students, while keeping the annual tuition costs for our families low. Our tuition is $4,500 lower than the average private school tuition in Wake County. We need the support—at any level—of everyone within our CCS community. The more we contribute, the more we achieve! In an attempt to better match your personal giving preferences with our existing needs, we offer both “unrestricted” and “restricted” giving opportunities. Gifts to our unrestricted fund (Area of Greatest Need) allow the administration to determine where your gift will make the greatest impact. Or, you may specify how your gift will support the school by investing in one of our four directed funds (Science & Technology, Athletics, Arts, and Financial Aid). Our 2018-19 Annual Fund goes toward our greatest need this year: investing in our teachers. Our goal of $200,000 will enable us to hire four new Upper School teachers to create margin for teacher development. Thank you for your prayerful consideration of support for Cary Christian School! How is my gift to the Annual Fund used? The Annual Fund helps fund essentials outside the school’s operating budget, including professional development, curriculum enhancement, art supplies, new technology, athletic programs, performing arts, clubs activities, financial aid, and more. These gifts are essential to the school’s excellence and financial strength. How can I help CCS with its Annual Fund? You can make your gift today! You can also encourage your peers to support the Annual Fund. Doesn’t tuition cover these expenses? Tuition revenue does provide 100 percent of the school’s operating budget, but CCS relies upon annual fund giving, capital gifts, and other non-tuition revenue to enhance the school’s resources and help ensure that our students have exceptional opportunities in the areas of academics, athletics, and the arts. Tuition increases can be controlled through the budget-relieving support that the Annual Fund provides. If I can only make a small gift, does it make an impact? YES, it certainly does! Your gift, combined with those from alumni, parents, grandparents, and friends, provides substantial support for the ongoing programmatic needs of the school. Every gift is an expression of support for Cary Christian School, and every gift matters. Participation matters because many foundations only fund schools that demonstrate wide support by their own alumni and parents. Participation level is also a factor in a school’s bond rating. Your gift is a show of your commitment to the school and a sign of the school’s strength. If I make a pledge now, when do I have to pay? You have until June 30 to fulfill your pledge. It is helpful to Cary Christian School if you make your commitment early in the fiscal year, even if you don’t pay until later. There are many ways to give a gift…by cash, credit card, securities, matching gift, etc. Please contact us or give a gift online now.